Presence. It's the ability of VR headsets to fool your mind and body into thinking that you are actually in a virtual world, and that experience is what Oculus seeks to deliver with its latest prototype. Code-named Crescent Bay, it's an evolution of the DK2 headset that only recently started making its way into the hands of developers. I got to try out the new hardware today at Oculus Connect, the company's inaugural developer conference. Come live vicariously through me, dear reader, as I tell you how it went. I'm fortunate enough to have worn every Oculus Rift since the first prototype was revealed to the world almost two years ago at CES 2013. Each time I put on one of the company's new headsets, it has been a markedly improved experience over prior iterations. Crescent Bay is no different. First off, the hardware, despite being a hand-built prototype, is surprisingly well put together. This time around, Oculus ditched the elastic ski goggle strap of its forefathers in favor of a plastic chassis with nylon straps to snugly fit it to your melon (a design akin to Samsung's Gear VR). It also has integrated headphones attached to the frame, so external ones are no longer needed. Crescent Bay is noticeably lighter than any other Rift I've held, and that drop in weight makes it more comfortable to wear. My only qualm was some light leakage around my nose, but once the visuals cranked up, the issue was hardly noticeable. Unlike some past Oculus demos, this newest one was on rails, so I wasn't in control of where I was going. However, I could very much control what I was looking at. 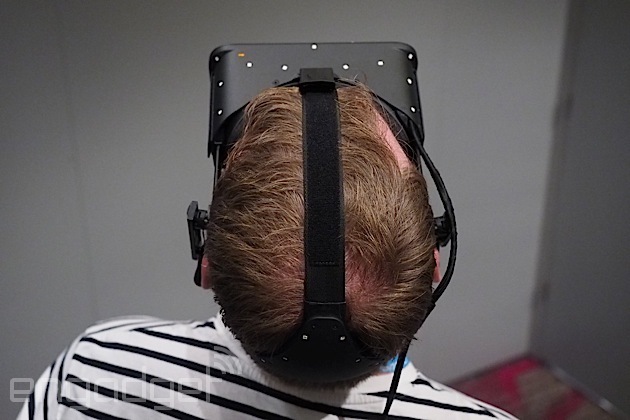 The headset works using a new in-house-constructed camera mounted on the wall (Oculus wouldn't say what's different between it and the one paired with the DK2 we saw back at GDC), and the tiny white sensors studding the front and back of the goggles. With this new combo comes 360-degree depth and head tracking in roughly a 1.5-meter square space. What that means in real-world terms is that you can now truly explore the virtual environment as you would in real life. I found myself regularly crouching down and moving around to examine the digital objects surrounding me from all angles. It's a much more immersive experience, and one that gets awfully close to delivering the feeling of presence that Oculus craves. It's not perfect. When moving my head side to side or squatting then standing up, I noticed some juddering and tearing in the objects around me. Those little glitches kept me from feeling fully immersed in the various digital scenes I was dropped into. Still, being able to shuffle around to examine the switches and knobs in a submarine or squat beneath an exploding car as it hurtled over my head is a thrilling experience. The sounds coming through the headphones weren't as powerful as I expected them to be, but that was probably due to ambient noise and a lack of volume more than any failing in the audio implementation -- and I'd need an external subwoofer to deliver the visceral experience I really wanted, anyway. I did come close to the feeling of presence, I think, during one portion of the demo that had me moving slowly forward through a giant disintegrating orb. I was stationary, of course, but my brain definitely thought I should be moving, and I found myself actively trying to balance myself as a result. It is the first time that I truly felt like the digital world had begun to take over more than just my visual perception. That sensation was fleeting, but Oculus' latest dose of virtual reality gave me a glimpse of presence. And that taste has me wanting more.